assembled size as shown 44" x 24"
This delightful Scroll Tree Branch design can be personalized! 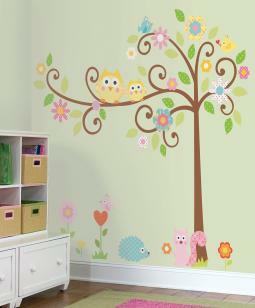 Decorate your little one's nursery or bedroom with these sweet and colorful owls, leaves, flowers, and branches. This design includes everything you need to assemble an adorable branch with owls, as well as hanging ribbons and blocks that can be personalized with any of the included alphabet letters. Hang the ribbons from the branches, add as many letters as you like, and then move the reusable stickers around until you've created the perfect design. Marvelous! A perfect match to our Scroll Tree MegaPack and other Happi designs.